While brands recognise the need to invest in digital marketing, they also need practical tools to measure and evaluate the business impact of these investments. Consumer touchpoints have also multiplied. Adults and children alike use several social media and mobile applications on a daily basis. But in order to catch their interest, toy brands need a well targeted multi-channel strategy. And to convert potential audiences into buyers, they also need to adapt to different purchase behaviours. Whether it’s online or offline, it is important to make it easy for the consumers to find and choose where to buy their brand products. Major toy brands have started to optimise their digital contents to create a seamless buying journey. Those who use Swaven’s POP (Point Of Purchase) solution to do this have reached 15X more qualified leads on average, and significantly boosted sales and the business impact of their campaigns. Let’s take a look at how it works through some examples of two industry leaders, Mattel and TOMY. Since two years, TOMY uses Swaven’s Point Of Purchase solution to make its brand contents instantly shoppable. Audiences visualising TOMY’s brand contents discover in one click where to buy the advertised products online and offline. No need for the consumers to search elsewhere, TOMY leads them directly to their preferred shops. Convenient and efficient! TOMY first started using the POP service in its video campaigns and in social media. This year the solution was also implemented on its website as part of a continued shoppable always-on strategy. So far, the group has launched several shoppable campaigns with Swaven in France and in the UK for Lamaze, Kiipix, Pokémon, Aquadoodle, Toomies and Molang. 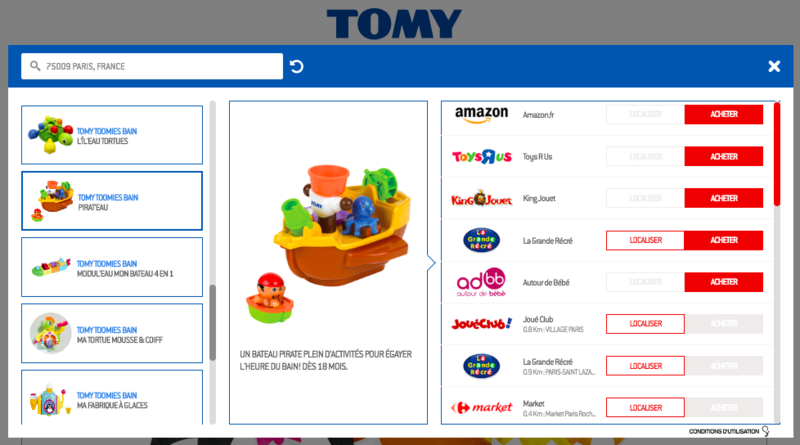 On Tomy website, a visitor can easily check a list of available retailers for any product and choose to buy it from an online retailer or locate a physical store nearby. This strategy allows TOMY brands to multiply the number of qualified leads to their retailers online and offline. And as a result, they increase their sales. In addition, the solution tracks the shopper paths from acquisition channel until purchase. With the collected data, the group can evaluate the performance of their marketing campaigns by brand, by acquisition channel, by product, by retailer, etc. As TOMY is using POP in multiple touchpoints, they get a clear view on which digital campaigns contribute the best and the worst to their business growth. Based on the insights they are able to further optimise their digital marketing activities to maximise their marketing ROI. Shoppable display ads are part of this new approach for which Mattel has chosen Swaven’s POP In Banner solution. Fisher-Price site visitors get retargeted with advertisements that redirect the consumers to their chosen retailers to purchase the products. 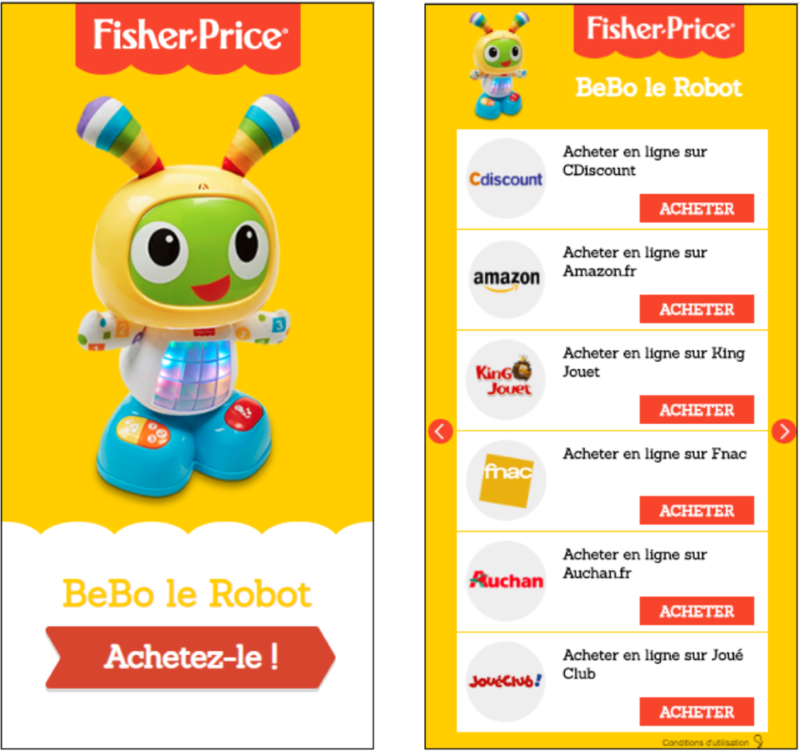 Fisher-Price shoppable banners direct consumers to retailers selling the product, in one click. Mattel’s other brands, Mega Bloks and Barbie are also deploying Swaven’s POP in their digital brand contents. With this type of multi-distributor ‘where to buy’ service, Mattel makes sure every consumer can easily find their products, in a shop of their choice. As the solution presents all retailers with available products, it adapts to all shopping preferences and allows to the group to serve all its audience efficiently. And this directly from within any digital brand content. Contact Swaven to learn more about POP solutions and services that help your brand increase your digital marketing performance.